During the past couple of years, vitamin and nutrition waters have broken on to the health food scene as the must-have beverage. Why wouldn’t you want to quench your thirst, hydrate your body and get a dose of vitamins at the same time? Unfortunately, each of those bottles comes packed with calories. If you’re like most people, you’ll drink the entire bottle in one sitting- meaning you’ve nearly tripled the calories, sugar and sodium you’re ingesting. In today’s Food Fight, we take a look at three popular brands- Aquafina Alive by Pepsi, Dasani Plus by Coke and SoBe Life Water by South Beach Beverage Co.
Each of these 20 oz. bottles advertises its vitamin content right on the front, as well as calories. We’re not too sure about bottled water that requires a calorie count. They each also note that they have natural flavors. Each of these vitamin waters’ nutrition label shows an 8 fl. oz. serving size, with 2.5 servings per container. How many of you drink 8 oz. out of a water bottle and then save the rest for later? So the nutrition facts I’m about to share, you can probably go ahead and multiply by 2.5 to find out what you’re really consuming. One side note- regular bottles of water do not have serving sizes or calories or grams of sugar. 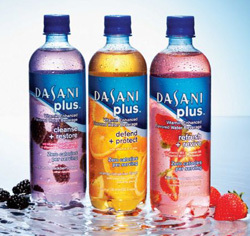 Round 1 is going to Dasani Plus as it has zero calories, the lowest sodium of these waters and a gram of fiber. I was able to find Dasani Plus and Aquafina Alive in similar flavors: Dasani’s Pomegranate Blackberry and Aquafina’s Berry Pomegranate. From SoBe’s Life Water I chose Strawberry Kiwi. Dasani Plus smelled like a popsicle when I opened it, like a popular kids’ sugary punch. The flavor seemed kind of flat. I didn’t really pick up anything too pomegranate or blackberry. The carbonation was about the only thing exciting in the taste. The first three ingredients include filtered water, maltodextrin (a common food additive used as a sweetener made from wheat) and natural flavors. It also contains a very long list of hard to pronounce ingredients and artificial colorings. Aquafina Alive was very subtle in smell and taste. The flavor is OK, and I can definitely taste the berries in this one. This water is not carbonated. The first three ingredients for Aquafina Alive include filtered water, natural flavors and phosphoric acid (a mineral acid used in food to give it a tangy taste; naturally this can be achieved by using ginger or natural citric acids). Splenda is used as a sweetener and it has a few other hard to pronounce ingredients. It’s concerning that on the Aquafina Alive Web site the ingredients list includes caffeine as the eighth ingredient- but that is missing from the printed label on the bottle. SoBe Life Water had a very light flavor that I enjoyed, and just a little sweet. It does not have any strong scent and it is not carbonated. The first three ingredients are filtered water, sugar and natural flavors. SoBe includes vegetable juice concentrate for color. There are also the herbal ingredients lemon balm extract and chamomile extract- giving this bottled water an herbal edge over its vitamin competitors. I give round two to SoBe for having the most palatable flavor and the least offensive ingredients. Someone had to win, but I wasn’t terribly impressed with any of them. It just left me wanting a glass of regular old water. Aquafina Alive, Dasani Plus and SoBe Life Water are each national brands. You are likely to find this in just about any grocery or convenient store you walk into. None of these waters were found to be available online. At my grocer, a national chain, Dasani Plus was $1.39, Aquafina Alive was $1.39 and SoBe Life Water was $1.59. Dasani Plus and Aquafina tie round three. Dasani Plus manages to barely win this DietsInReview.com Food Fight. Water is so important to the health and vitality of your body- it seems you’d gain more by just drinking water. I don’t ever remember a time I had to look at a nutrition label before drinking a glass of water. If it’s vitamins you’re after- try having a piece of fruit or some vegetables. You’ll likely get more out of a serving of that. Vitamin and nutrition waters is a cash-cow of a trend that the beverage companies are riding all the way to the bank. Other popular brands in this category that still don’t quite stack up are Propel Fitness water with 10 calories and 2g sugar and Glaceau Vitamin Water with 50 calories and 13g sugar. Make sure you’re reading those nutrition labels! Well, I’m not a huge fan of these…however, I can think of a few positives. First, if you are a regular soda drinker and are wanting to make your way to drinking more water, but still aren’t ready for the original, non-flavored water then these flavored waters are an ok choice. Brandi brought up a good point, portion control/serving size. Rarely do people consider the beverages they drink and calculate it into their total calories for the day. Whenever I drink one of these flavored waters (which is a very low occurrence) I make a note that these calories take away from my meal calories. I would rather spend the extra calories on food then a drink! For me I am more satisfied drinking water and squeezing a lemon, lime, or orange in it. I suggest you try fresh fruit squeezed in instead of these flavored waters. Vitamin Water hands down is the best tasting! Also it’s the only one you will find in a health food store, so I assume the ingredients and purity must be better than the others as well.